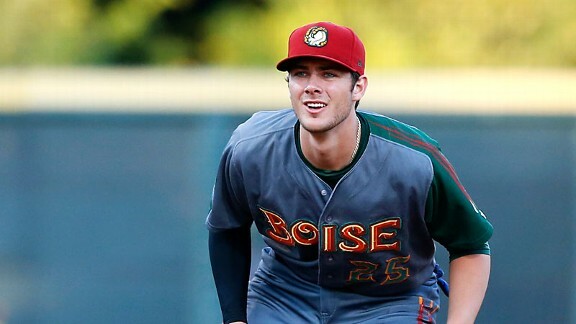 Cubs 3B Prospect Kris Bryant is continuing his year-long tour of baseball abuse with the Mesa Solar Sox in the AFL. In basketball the athletes chosen in the first round are expected to contribute immediately, meaning that a draft can change the chances of success for a team with a shrewd first round selection. This is not usually the case in baseball, where it often takes a year or two before a draftee is even mentioned amongst an organization’s top prospects, even in weaker minor league systems. The development of pitching and the difficulty of hitting said improving pitching necessitates a slow and gradual build toward the crescendo of the Major Leagues. Cubs 3B Kris Bryant still appears to be waiting for that challenge to present itself, despite the fact that he’s been facing live pitching since January. In the Arizona Fall League last night, Kris Bryant got a single hit in the Solar Sox’ contest against the Surprise Saguaros, bringing his AFL wRC+ up to a Miggian 213. He also kept alive a streak that has reached 20 games spanning back into the regular season, including each of the 17 AFL games he’s played in, where he’s reached base safely. This is not to say that Kris Bryant is set to make the Cubs’ roster out of Spring Training, that simply is not going to be the case for timetable and business reasons as well as the still-gigantic gap between High-A and the Bigs. In fact, they confirmed as much today. However, for a draftee from this year’s class even to already be mentioned amongst the top talents in an already very strong minor league system is remarkable. It’s truly testament to the talents that got Bryant his draft-day reputation as an extraordinarily polished college bat, nearly ready to produce at the highest levels. Questions about his ability to stick at third have quieted but not altogether disappeared, but it isn’t Bryant’s glove that have had the brass in Chicago rearranging their depth charts for 2014; his bat may force their hand well before the end of next season, especially if his performance is accompanied by more strong showings from the org’s other top prospects. Bryant made a joke out of the college circuit, posting gaudy video game numbers up until the draft. Among the highlights from his final year at SDU include 31 dingers in 62 games, walking 66 times against only 44 strikeouts for a .493 OBP and an OPS over 1.3. That is all well and good, we are long past getting too wrapped up in amateur numbers, but it is of note to point out that Kris has basically been ‘locked in’ for nearly a calendar year. Prospects often struggle when being moved up a level in the minors, facing a higher level of competition, better breaking balls and more polished players tends to do that, and prospects often ‘stall out’ after the jump. This is obviously very true of the jump from the college and high-school circuits as well, and it would be fully understandable for a hitter to take a season to adjust to hitting baseballs professionally. Bryant appeared to have no such problem after the jump to pro-ball, posting a .354/.416/.692 line in low-A and forcing a promotion to the Florida State League to close out the year. Again, tougher competition and an already-long season could have taken the blame for any adjustment period had there been one, but Bryant instead posted an insane .333/.387/.719 line for a 212 wRC+ in high-A. Like I said before, many prospects wash out in A-ball. It is completely understandable for the nearly-ready talent present all over AA to crush the tools of those who ride hot seasons into the home of the top prospects. It does, actually, still remain to be seen how Bryant will handle starting the year in AA. However, because he is apparently a hitting robot who suffers from neither the fatigue nor the slowness of hands that befall us all, he went on to continue his long season in the AFL. The Arizona Fall League is like the prep school for prospects who are about to enter the Major Leagues, and is widely considered to be on a skill level somewhere around the high end of AA. Bryant has crushed this year’s AFL pitching to the tune of a .358/.436/.746 line in an admittedly tiny sample of 78 PA, in spite of the rest of the league posting by far it’s lowest OPS in the last five years. It’s not all puppies and unicorns for the Cubs’ 3B of the future, however, as these incredible performances (like nearly all incredible performances) owed themselves to at least some considerable amount of luck. In the minors he posted a BABIP above .400 and it’s shot even higher to .462 so far in the AFL. While every time I’ve had a chance to see video of Bryant he is lining balls all over the yard, that is just an unsustainable type of number for someone who struck out in about a quarter of their plate appearances in single-A, or anyone at all for that matter. Bryant has walked at an above average rate across the year, apart from his stint in high-A where his strikeouts rose and walks tumbled, which could help offset the incoming beast of regression, but expecting these kind of numbers to continue seems like a fool’s errand, regardless of the quality his batted ball mix and his ability to take a walk. From what I’ve seen, he profiles more like a high-average hitter with plus power than an elite average hitter with plus plus power, basically more of an Fielder than a Cabrera offensively; but what team wouldn’t be happy adding that to their roster? All in all, despite the amount of press given to Baez this year I have enjoyed following Bryant’s success the most. (Admittedly, it may have been bitterness due to his spurning of my Blue Jays in 2010 that had me following him in the first place.) There are holes in both of their games but I see Bryant contributing large to the big squad in 2014 as soon as they can avoid the Super Two cutoff, and if literally all of 2013 is any indication, he’s not going to be giving them much choice. Posted on November 11, 2013, in Arizona Fall League, Cubs, Hitters, Top Prospects and tagged Kris Bryant. Bookmark the permalink. Leave a comment.